I can't thank you enough for the gift you've given us. My reversal was done on 5/29/07. After a lot of research, discussion, and thought. More than one prominent doctor had told me "not to bother" with the procedure after such a long time (approximately 17 years since vasectomy). My wife found Forerunners Healthcare Consultants while doing research on the Internet; his success rate really caught our eye. When I contacted you. Mr David Johnson- who underwent Minimal Invasive Laparoscopic hernia repair at the wockhardt hospital. 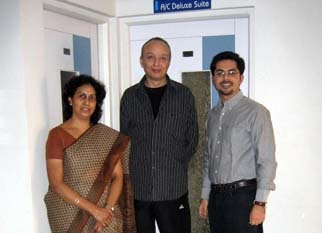 He says- "I am very thankful and grateful to Dheeraj Bojwani And Forerunners Healthcare-who co-ordinated my full trip. The rates that he got me for the surgery were unimaginable. The myriad of phone calls and emails,arranging my visa on time Were so wonderfully co-ordinated that my trip was absolutely Hassle free and was a wonderful experience.If the need arises again-I would be back here without a second thought. 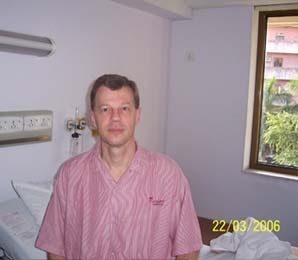 Ray K Shaw- Pilot of a private jetliner came to India for his dental Implants in Delhi-India.He is a British Patient.